Get up close and personal with some of the many varied Celtic pipes! Come and Try Workshop: full of information and explanations about the all sorts of Celtic pipes including Irish pipes, Highland bagpipes and the Scottish small pipes. There will also be opportunities to try the chanter and learn about the instrument, it’s music, and for those interested, where to learn some more. Come ‘n try Scottish Drumming for beginners with DrummingMad at the festival. If you have ever wondered how it feels to play a drum to a Scottish piping tune, this is your chance to do so and we invite you to come along. You don’t need to bring anything except your curiosity and enthusiasm as will have drumsticks and pads ready for you to try out this challenging, awesome and not to mention LOUD world of Rudimental Drumming. The National Celtic Festival hosts a full program of piping and drumming across the long weekend. Don’t miss out on a great line up of piping and drumming themed concerts, masterclasses, workshops for all levels, piping competitions, DrumWorx spectacular and pipe band displays – all part of the unique, National Celtic Festival experience. When the Highlands and Islands of Scotland adopted the bagpipe, perhaps some six hundred years ago, they began to develop the instrument and its music to suit their needs and tastes. What emerged was the instrument we know today as the Great Highland Bagpipe, and a form of music, piobaireachd, which is unique to the instrument. It is a very stylised form of music. There is freedom in the theme or “ground” of the piobaireachd to express joy, sadness, or sometimes in the “gathering” tunes , a peremptory warning or call to arms. The word “piobaireachd” literally means pipe playing or pipe music, but is now used to describe the classical music of the Great Highland Bagpipe. Another name for it is “Ceol Mor” meaning the Big Music, which separates piobaireachd from all other forms of pipe music (marches, reels, jigs etc.) which are referred to as “Ceol Beag” – the Little Music. To describe a piobaireachd is not easy. It consists of a theme or “ground”, with variations (which vary in number and complexity) that follow the theme. The theme is often very slow, and the general effect of the whole piece of music is slow – slowness being a characteristic of Highland music. Nothing resembling piobaireachd has been discovered in any other country in the world. This concert will present the influence of the MacCrimmon family from the Isle of Skye, who were pipers to the Chiefs of Clan MacLeod. The MacCrimmon’s were legendary and in Borreaig (near Dunvegan) taught Piping at one of the best known piping colleges in the Highlands. Each piper will present a short excerpt showcasing styles of lament, battle tunes, salute, warning, etc. This will be an absolute treat in hearing Highland Piping in it’s purest and most emotive form, explained and performed by Victoria’s top pipers. 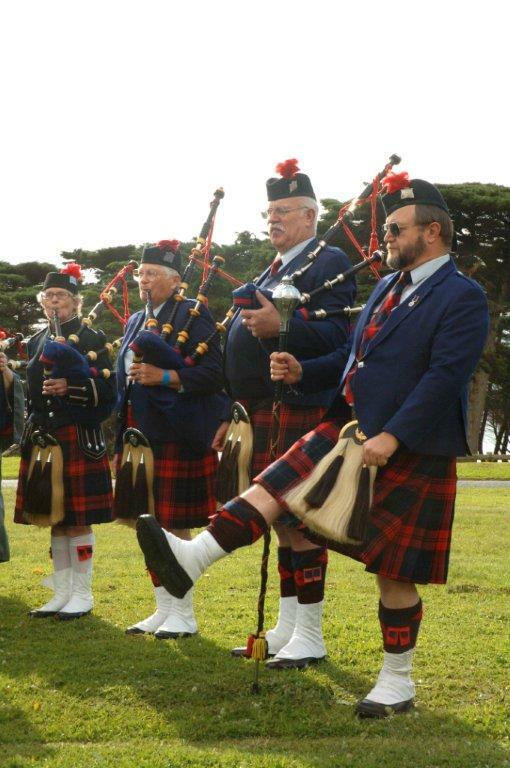 Geelong RSL Pipes and Drums was formed in July 2002 and is Geelong's only competing pipe band. 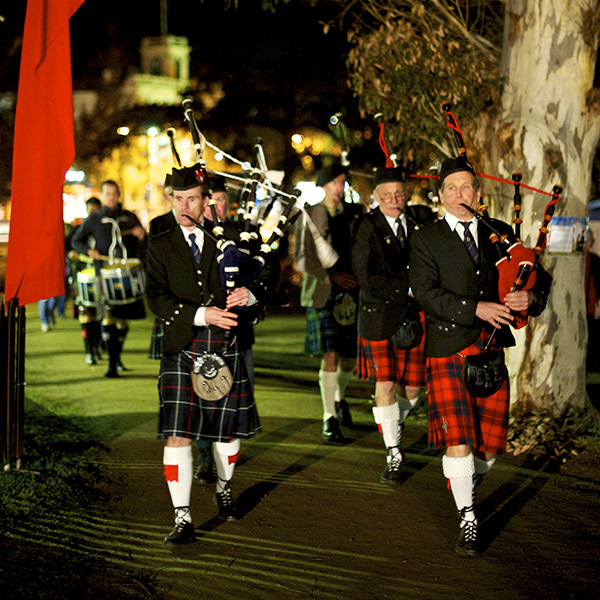 Geelong RSL Pipes and Drums first entered the competition arena at Ballarat in February 2003. You will recognize the band in their Red Robertson Tartan - then will join us on Saturday. Band members will pop up throughout the week-end for small band perfromances. Recognising the influence of legendary Scottish piper Gordon Duncan, we’ve invited 4 of Australia’s premier solo pipers to compete in a 15 minute piping challenge playing tunes written by Gordon, to win the 2018 National Celtic Festival Piping Challenge. Fingers flying, music flowing, this is Australia’s piping at it’s best. Jamie is truly a global piper having competed regularly in Scotland, New Zealand and Australia both in Solo Piping and Pipe Bands. His record is impressive having won the NZ Gold Medal Piobaireachd and Former Winners Clasp, NZ Silver Chanter MSR and Former Winners Clasp and RU Brown Adelaide Gold Medal. Now residing in Melbourne, Jamie is also Pipe Major of the Canterbury Caledonian Pipe Band and is the 2017 winner of the National Celtic Festival Piping Challenge. Jono began piping at 11 years old. He was initially taught by Ross Campbell and has also had tuition from some of the worlds best players, Roddy Macleod, Chris Armstrong and Murray Henderson. He lived in Glasgow from 2004 to 2006 playing with the Lomond and Clyde pipe band and worked with the National Youth Pipe Band. Josh started playing the pipes at the age of 13 at Haileybury College, Melbourne and was taught by John Young. He recently became the Pipe major of Old Haileyburyian Association Pipes and Drums and is also a member of Canterbury Caledonian Society based in Christchurch New Zealand, one of the top 10 Pipe Bands in the world. As a solo piper, Josh is an A grade competitor and one of Australia’s most exciting emerging talents, having won every section at the 2017 Victoria Solo Piping along with the VPA Silver Medal, The New Zealand Silver Chanter and also competed in the 2017 Pipe Idol at Piping Live, Scotland. William started learning at the age of 12 and made a rapid rise through the piping grades to the top level in 2016. He’s also competed internationally at the World Pipe Band Championships in the premier grade and solo at the Piping Live! Festival for Pipe Idol amongst the worlds best young pipers. His rapid rise through the solo piping grades is widely respected and in 2016 played with the New Zealand Police Pipe band at the World Pipe Band Championships. Locally, Will plays in the Hawthorn City Pipe Band, the current Grade 2 Australian Champions and still competes with the New Zealand Police Pipe Band, the current Grade 1 New Zealand champions. 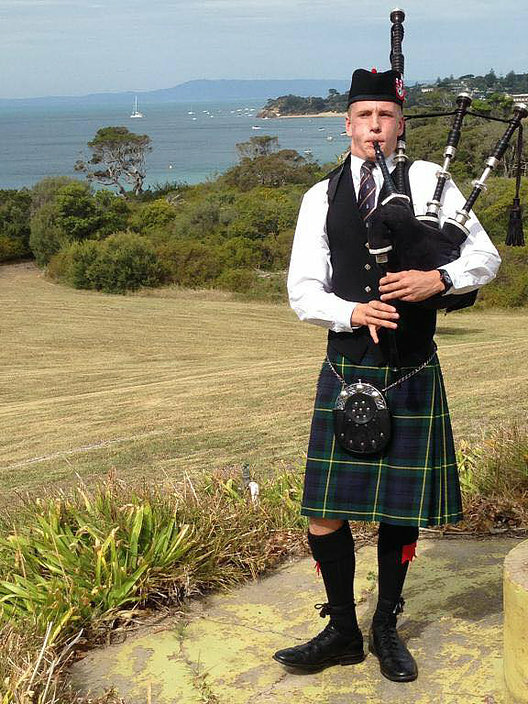 Will is a Bagpipe teacher at Scotch College Melbourne, and the Head of Bagpipes at Geelong Grammar.